It’s been four years since AJC photo journalist Bita Honarvar and I took a C-130 military transport from the safety of Kuwait into the horrors of Iraq. We were just starting an assignment to cover the Georgia Army National Guard’s 48th Infantry Brigade. 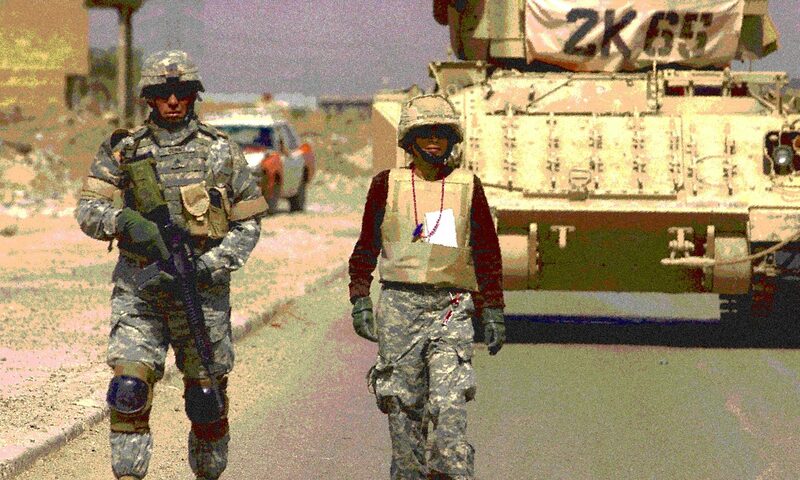 It was my first trip to Iraq as an embed – I had never been exposed to the conflict through an American soldier’s lens. Within hours after arrival at our dusty two-person tent at Camp Striker, adjacent to Baghdad’s airport, I stumbled upon the worst news possible: The brigade had just suffered its first four combat casualties. Later, I would discover they had died in gruesome fashion. The last of a three-Humvee convoy rolled over a 600-pound bomb hidden in the road. The military calls such bombs “improvised explosive devices” or IEDs. But to me, there is no other word for a bomb that kills with such precision, such ease. All four men in that Humvee were alive one moment, oblivious of their fate. Within seconds, they were gone. They were members of Alpha Company, 2nd Battalion, 121st Infantry Regiment. I had watched them train in the winter, among the tall pines of Fort Stewart, just outside of Savannah. I had watched them train in the unforgiving Mojave Desert, in camps and terrain designed to simulate Iraq. They had practiced so hard for war, yet in the end, they never had a fair chance. They never got to fire back at the enemy. My first Iraq story for the Atlanta Journal-Constitution that summer was about the four men and their memorial. The commanders made it clear that reporters were to stay away from the traumatized men. I didn’t know how I could talk to them. I wanted to tell their story. What does it feel like to bunk with a man one night and stare at an empty cot the next? Do you wonder how much they suffered? Do you fear it will happen to you? How do the days pass without their laughter; without their friendship? How do you find the strength to carry on? On my second day, I stumbled across two of the soldiers from that unit in the Striker PX. We struck up a conversation in the checkout line. Later that night, Spc. 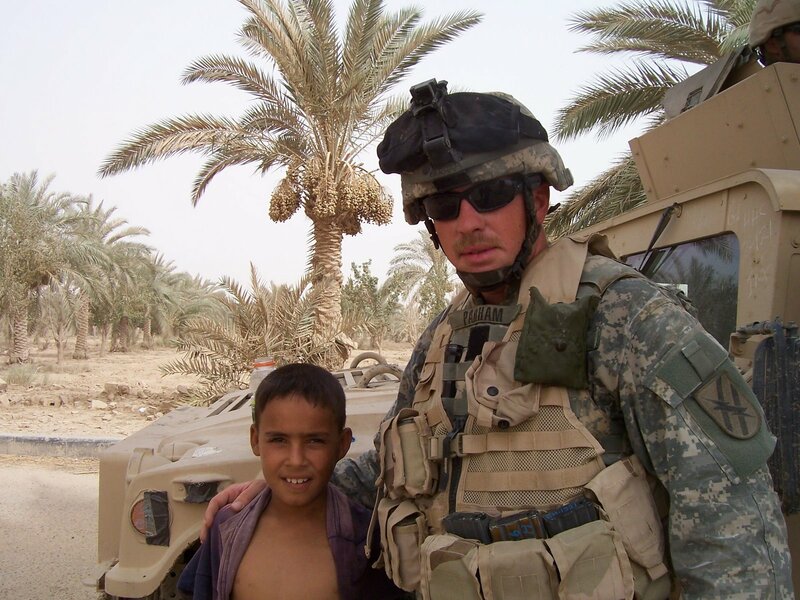 Shane Parham, a “country boy” from Social Circle (pictured here with an Iraqi boy) came by to speak to Bita and me. I believe he found the company of women comforting; he knew we would not judge him or think him weak. He could let his guard down in front of us and not have to act the macho infantryman that he was trained to be. We fought tears as we listened to what he had witnessed. He was part of the body recovery crew. He had seen what no man should ever have to see. Suffice it to say that parts of the Humvee and the equipment the soldiers carried that day were strewn about the fields and ditches of southwest Baghdad. I know because I saw them every time I went out on a mission with 48th soldiers. Part of a helmet; a Gerber knife, pieces of Army green Humvee seats. My heart raced and I feared the worst as we drove up Route Red Sox, the name the soldiers attached to the dirt road lined with canals, ditches and thick clumps of papyrus and bamboo. I have my notebooks from my conversation with Shane – two steno pads filled with a soldier’s words. Hardly any ever appeared in print. I knew that his emotions were raw. I chose to respect him in this terrible moment of overpowering grief and anger. I knew I could learn from him. Bita and I covered the memorial service. It was my first for a soldier who died at war. I was taken with the ceremony. There’s something very powerful about an empty pair of desert boots, upended rifles with helmets slung over them. Dog tags belonging to the dead, dangling on the stage as if so say: Don’t ever forget my name. And then, the unthinkable happened: Four more from the same company, the same platoon, were dead. They were also in the last vehicle of a three-Humvee convoy and rolled over a hidden bomb. The men and women at Striker trembled openly. They withdrew to their tents; spoke in whispers. Shane took me to see the guys in Alpha Company. I will never forget walking into the 16-man tent to see the eight empty cots. The survivors, sat with heads bowed, trying to find the right words to tell a reporter. It was as horrifying as anything else I had witnessed: mass graves, earthquake victims, executions. I see people on Atlanta roads who have yellow ribbons plastered on their cars. Support the troops, they say. I wonder how many of those people really know what some of these men have been through. Going to war may be heroic and patriotic. It may even be honorable sometimes. But it is never glorious. My real understanding of what U.S. soldiers experienced in Iraq began on that July day four years ago. A profoundly sad anniversary; thank you for honoring the memory of those soldiers. To the question of whether people here understand the reality of that war, we don't. There are many reasons for that, but the most outrageous is the Bush administration's cynical policy of hiding the coffins of the casualties. It seems a deliberate effort to manipulate the truth, minimize the impact of war, and control the public's perception and response to an ongoing tragedy.